I lived in Chicago for three years. And even though it was on a military base north of the actual city — Great Lakes Naval Training Station to be exact — I do proclaim myself to be semi-Chicagoan. I’ve experienced the snow storms, summer humidity and tornado warnings, learned about wind chill factor and went on school field trips to the the Sears Tower (now known as the Wallis Tower). I was even there when “Da Bears” won the Super Bowl and everyone I went to school with knew the words to the Super Bowl Shuffle. So when I saw Lefty’s Pizzeria jam-packed with Chicago memorabilia, I felt like I was transported back to Chicago. There are items for the Bears, the Cubs, the Blackhawks, the Bulls, the White Sox, etc. And every time I visit, the television always seems to be tuned to a Chicago team sport. It will make any homesick Chicago native feel at ease. But the food! 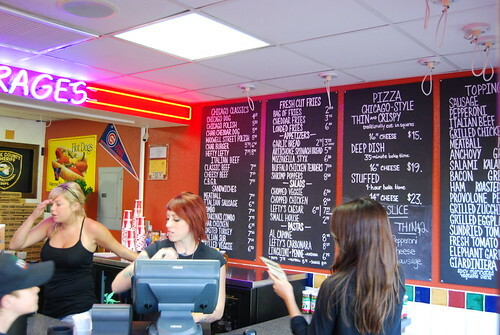 Lefty’s menu has Chicago classics like hot dogs, polish dogs and pizza, of course, available as a deep dish or thin crust. Admittedly I’m not a connoisseur when determining whether a deep-dish pizza is authentic but Dennis at Radiused Corner gives it rave reviews. As for their Chicago hot dogs — it’s the equivalent of a hot dog salad on a bun! A fully-loaded Chicago dog includes tomato slices, diced onions, a pickle spear, mustard, sport peppers, green relish and celery salt (the secret ingredient to a true Chicago dog). If the bright green relish doesn’t bother you, the toppings add a full flavor to the dog. It’s actually the only time I like relish and raw onions on anything. The seeded bun is soft and pliable — a nice touch since a cold bun always ruins my sandwich-eating experience. The Chicago hot dog comes with french fries. It’s a hearty meal, but if you’re looking for something with a lot of heft, the C.B.G.B. sandwich is the way to go. The C.B.G.B. stands for cheesy beef on garlic bread. It may not look like much but this sandwich weighs nearly a pound. Thin slices of beef top a sandwich roll but between the roll and the beef is melted provolone cheese and garlic/parsley seasoning. The whole shebang is dipped in au jus. What you don’t see are the sweet peppers that usually top it. 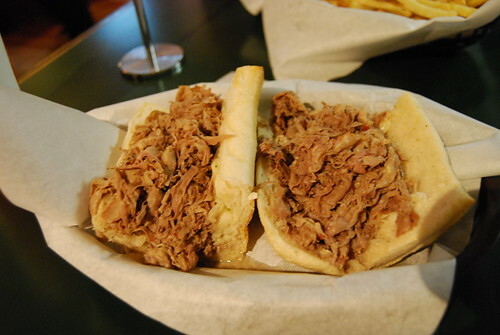 It’s almost too much for one person to eat, but between the house-roasted meat that tears away easy and the cheese infused with garlic — one bite and you’re addicted . Next on my list is to try their deep-dish pizza, which is especially difficult with my on-going addiction to their sandwiches. 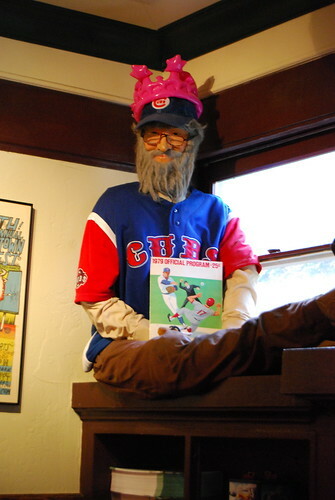 Now if I can only part with my Walter Payton autograph the owners of Lefty’s have been coveting…! 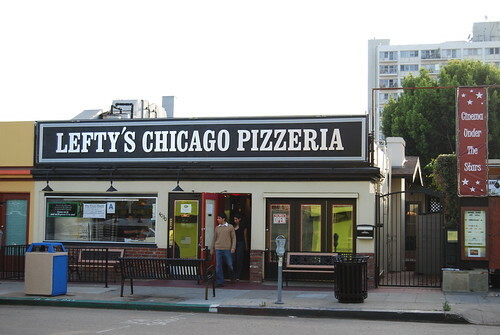 Lefty’s is housed in Mission Hills (at the former Phil’s BBQ location) and in North Park. Both Lefty’s are closed on Mondays. Well, now you’ve made me hungry. 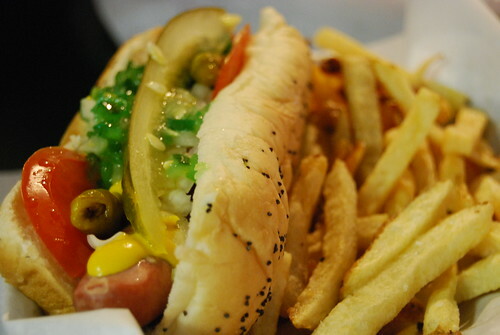 The bright green relish is one of my favorite parts of a Chicago dog! I’m not sure how they get it so neon, but it’s seems like one of those things that just “is”. Radioactive gives you superpowers! I didn’t realize you could only get it in Chicago. How fun for you! I am so glad you that you are trying the foods that are unique to Chicago. That is the best! I wonder how you will feel about the deep dish pizza. It always looks so tasty, but I can’t help but love my new york think crust pizza! Thanks for checking out my random recipe. It seems weird to can hamburger and I have been against the idea for some time. I recently caved because I realized it saves money if I can buy a bunch on sale, cook it up, and store it. It also is saves freezer space, and is usable if heaven forbid the electricity goes out. I live in Arizona so the natural disasters are slim except for the permanent heat :), but I would like to have a bit of food saved up in case we did lose power or something or even if my husband loses his job and groceries add up. A lot of folks are losing jobs these days and if I had food saved up we could survive better. What do you think? I felt especially motivated after Hurricane Katrina. Thanks for the hint, Nick. I like the idea of a layer of sausage. Is there an extra cost for it? I am a HUGE fan of pizza but afraid that I wouldn’t know an authentic Chicago deep dish from any others. The Great Sausage Pie falls under “Specialty Pie”…so I guess that would be yes on extra cost – We’ve tried just sausage on the other styles of pizzas and it didn’t taste the same to us…not bad…just not the same – If you have had stuffed in Chicago…my favorite has always been Gino’s East but only the original spot and Nancy’s was really good too…then don’t be afraid because this is as authentic as it gets – Good eating!